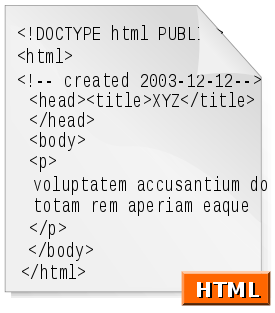 Hyper Text Markup Language ("HTML") is a markup language that describes the general structure of documents. HTML is based on the theory that most documents have common elements, headers, paragraphs, bullet lists, tables, figures etc. and that you can label the various elements of your document. HTML also offers rudimentary character based formatting such as boldface, italics and underline. With HTML you label your document using "tags: that specify the document element you want. Most HTML tags are paired using one tag to specify the beginning of a document element and an end tag, usually the beginning tab preceded by a "/", to specify where that document element ends. There is a special hypertext link tag, ... , which specifies that the text between the tag and the tag is a hypertext link. Hypertext links can be used to create footnotes, automatic indexing and cross references. Unlike sophisticated Page Description Languages such as PostScript, HTML does specify how or where document elements will be shown on your screen, this is one of the jobs of the web browser. Web browsers are programs which locate information on the Internet and present it on a terminal. The web browser locates information with the help of a Uniform Resource Locator ("URL") in a fashion similar to how the post office locates your house with the help of your home address. Just as house addresses are broken down into various parts such as street address, city, state and zip code, URLs are also composed of various parts, well actually three parts, the protocol, the host name and the directory. The protocol indicates what kind of information the browser should be expect. If you are trying to access a FTP file the protocol will be FTP, if you are trying to access a gopher document the protocol part of the URL will be gopher. Most of time you will be trying to access HTML files the protocol for which is HTTP. HTTP stands for Hypertext Transfer protocol and is the protocol web servers use to send HTML information over the net. A web server is a program running on a machine connected to the Internet which waits for a web browser to access it and ask for a file. After it has received the file request if locates the file and sends it back to the web browser. Browsers and servers talk to each other using HTTP a special language, or protocol, created specifically for transferring hypertext documents over the web. The web server includes information on the file type so that the web browser can figure out how it handles this type of files. 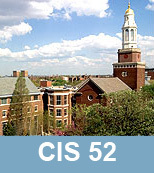 The second part of the URL, the host name, is the system on which the information is stored, such as netscape.com or acc6.its.brooklyn.cuny.edu. The third part of the URL, the directory, is the location of the information on the host. In addition to finding information on the Internet web browsers are also responsible for interpreting and formatting HTML. When you load a page into your web browser it parses the HTML code and formats the text and images on the screen. Questions on how the text and images are formatted on the screen -- are headings centered? are subheadings boldfaced? is the "..." tag represented as boldface, italics, reverse video, blinking text or simply in a normal typeface? -- are left to the discretion of the browser designers and different browsers will often present quite different interpretations of the same HTML code.